Mark Avery as Mr Bashful. Mark Avery became a soapbox speaker to improve his public speaking skills and get feedback on his ideas about happiness and resilience. However, he is nothing like your typical happiness guru: his approach is down to earth and refreshingly different. 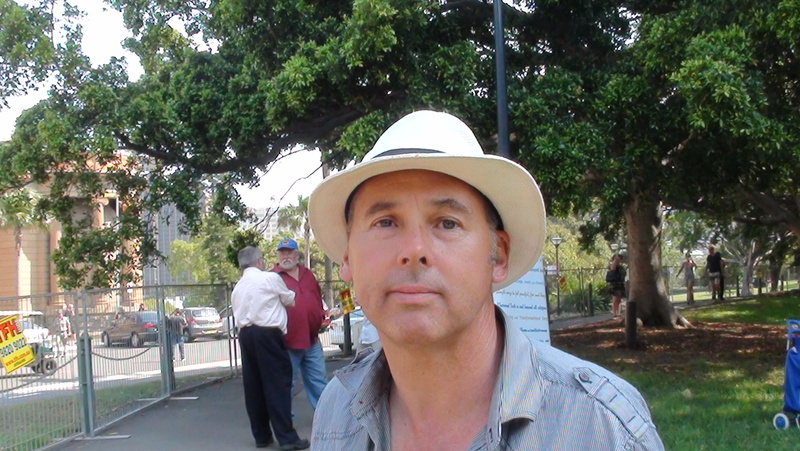 You’ll find out why when you come to Speakers’ Corner or visit his site mrbashful.com. Mark speaks of other things too, to give his grasshoppers variety. Mark once went for an entire year avoiding the news and current affairs in all its forms. His aim was to clear his mind of paradigms and view life with ‘new eyes’. He succeeded only in becoming painfully ignorant. He presented an Ockham’s Razor talk on Radio National. He won the ‘Now Hear This‘ speaking competition on Radio National, hosted by Melanie Griffith. He gave a Sydney Ignite talk on why we should burn the Mona Lisa. Seven billion people . . . seven billion worlds. An unorthodox method of gaining nirvana. An eccentric point of view that might just have a little merit. The delicate Mr B has one of his grasshoppers turn on him.